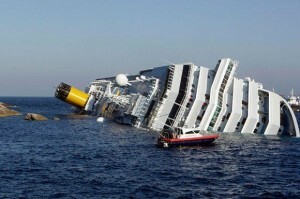 The catastrophe of an Italian cruise liner,the Costa Concordia, has resurrected all kinds of connections to Titanic. Despite some eerie parallels in survivor accounts, theyare not the same. I will spare readers any cliches to Titanic as this ought to be judged strictly on its own terms. The captain, if press accounts are to be believed, made a serious lack of judgment by failing to use proper seamanship. And he may have abandoned ship without good cause. Transcripts of exchanges between the Italian Coast Guard and the captain telling him to return to his ship are damning. It is almost predictable that politicians want to jump into the fray. In 1912 there were serious and compelling reasons to do so. Both inquiries, American and British, uncovered a lot of important details that resulted in major changes. Lifeboats for all, 24 hour communication watches, better attention to iceberg threats (International Ice Patrol), changes in shipbuilding etc. Technology has vastly improved since then. Radar, satellites, more accurate charts, better ship handling technologies. Even with the most sophisticated of technology implemented on modern day ships, catastrophes can still happen. Mighty Poseidon wields a powerful trident and waves can knock the best designed ship around. Cruise ships and passengers caught in a terrible storm that thrashes them about have to trust the captain and his crew to get them safely through the night. Nearly every cruise ship today is designed with safety of passengers in mind. And few run into serious problems. Most western nations have strict regulations and the United States is considered the toughest (and the reason so many cruise lines register their ships elsewhere). And most ships are regularly inspected for safety compliance. The ship officers and bridge crew have to be competent and experienced. Regular drills to deal with emergencies are common. Nothing though compares to the real thing. In An Officer and Gentleman one of the aviation candidates asks if the water simulation (where you simulate falling into the ocean after bailing out) is like the real thing. The petty officer says it is not at all like the real thing. And that is why you drill often, so that when the moment comes you avoid panic and think through the situation. There are conflicting accounts whether the crew responded well to the catastrophe. The fact that so many passengers were secured says something went right. Otherwise we could be talking about large numbers dead instead of the low number thus far. The inevitable investigations will reveal more fully how the catastrophe happened. Right now it appears the captain and first officer made serious mistakes but one must resist coming to conclusions until all the facts are in. Press reports, especially initial ones, can be very unreliable. There will no doubt be problems found, they nearly always are. 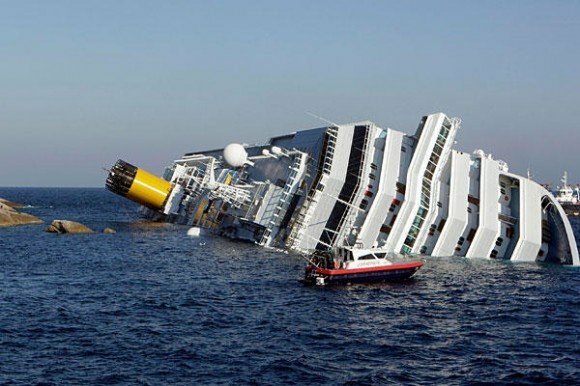 Jumping in and demanding hearings on cruise line safety is nothing more public grand standing by politicians desperate to show they are concerned. This is not 1912 and what happened was likely poor seamanship rather than a major flaw in either safety regulations or ship building design. Some very interesting images and more details can be found at Universe Today. I noted yesterday that the increased passenger levels meant no fare hikes. I forgot about the proposed “Changes To Condified Tariff” that will soon be decided upon by Caltrain. According to press release, Caltrain plans no fare increases for Clipper users but on cash passengers. They will pay 25 cents more per zone. If you use Clipper from San Francisco to San Jose, the one way fare is $8.75 or $17.50 roundtrip. Cash users will pay $9.75 or $19.50 roundtrip. They plan to eliminate 8-Ride Tickets and increase Go Pass Cost. Eliminating the 8-Ride ticket is a good idea. It simply has been a major headache for most users. The old system simply required a machine stamp before boarding the train. The reason for this ticket was for those people who travel infrequently during a month but not enough to buy a full monthly pass. What Caltrain ought to do is offer something that BART does, the High Value Ticket that offers a discount. And consider free parking on weekends like many BART stations do as well. *San Bruno (temporary station)-The droning gas fired lights has been replaced by the steady glow of parking lamps. This is good news for the residents of the area. Now the parking lot is clearly illuminated. And the out of service info screen on the northbound side has been fixed. Sadly one of the Clipper readers on that side is still out of order (at least two months now). *The Clipper machines at Fourth & King are fully operational. You can add cash or passes to your Clipper card at these machines. No really, you can! There was a long line the other day at Walgreens across from the station. While getting my favorite trail mix bars, one guy in line (the line went down that aisle) said there were Clipper machines at the station but not operating. I pointed out that there were now online and could add passes to a Clipper card. He and a friend left while others, to my surprise, stayed right there and one person saying “I don’t think you can do that….” Well folks, you can. *You see funny things when sitting around Fourth & King station while waiting to board a train. If you frequent it enough you recognize the street people who constantly check the garbage for aluminum cans or anything else they might need. Some drift through asking passengers for spare change. Others just sit a while during the day. There are notable ones that mutter to themselves and saying things that only they can understand. Then again perhaps some of the ordinary people do things that seem odd. Take one gal I saw recently. Her carbonated water was too agitated when she opened it. Now most people would find some sensible way of dealing with it. Hers was to spill it out on the floor just behind one of the benches. Made for a nice puddle that the janitorial staff had to clean up later. *Some months ago there was a directive issued that during non-commute hours and weekend trains that tickets be checked prior to boarding in San Francisco/San Jose. A lot of conductors did not like this and voiced their displeasure. Now it looks like either the rule has eased up or some conductors are just not doing it. Perhaps the change in management (Amtrak lost its long standing contract with Caltrain) has made the conductors less afraid to defy. However do not think they are not checking aboard the trains. One diligent conductor on southbound 284 checks nearly every time usually when the train pulls over in Bayshore to wait for the express to pass. And the policy of ticketing without exceptions appears to be in full force. *Northbound train 159 is rarely on time and nearly always 3-4 minutes off but sometimes longer. It is a late afternoon train (it departs San Jose at 3:05 P.M.) and is supposed to arrive in San Francisco at 4:38 P.M. It is rare to see it pull in early (it does happen). One time it was ten minutes late into San Bruno and of course no explanation. *News reports indicate passenger levels have risen on Caltrain. There are two possible factors (excluding weekends which draw different numbers from the weekday). One is that South of Market (SOMA or to us old timers south of the slot) has a lot more people working in the area than before. Second is that people are switching their mode of transportation to Caltrain from BART. BART is more expensive from San Bruno and Millbrae to San Francisco than Caltrain. The drawback is that from Fourth & King you have to take SF MUNI to downtown. The good news is that Caltrain is not planning any fare hikes just now. The bad news is that they still have major financial problems. Perhaps all that money for the high speed rail to nowhere could be shunted over to Caltrain. *There is a new Subway outlet near the San Francisco station. Head east on Townsend and just past the Golden Arches. *Signs of doom when aboard a Caltrain: The train scheduled to leave later departs before your train. Take a look at https://www.thetitanicnecklace.com. Tacky or not? The new year has finally arrived. It was greeted, depending on how you celebrated it, either with a large crowd of people waiting for that moment or a small gathering at home. Traditions vary around the world. Austrians love to dance to the Blue Danube after the last bell has struck. Fireworks are often used to herald in the new year or perhaps the banging of pots like they do in Ireland. For me it was mostly quiet and in bed long before the midnight bell. There were assorted shouts around where I live, firecrackers going off, and clinking of glasses. Sunrise brought a quiet and mildly cold morning. Of course being 2012 means Titanic is going to be important. It is the centennial of Titanic’s one and only trip. So many events are being planned both large and small. Belfast is using the event to undertake major renovations and building the Titanic Quarter. A place where both past and present will be on display. Titanic exhibitions are being planned and plaques to Titanic heroes and victims are being refurbished or set up for the first time. Special cruises are planned to follow Titanic’s path and are nearly sold out. Of course all kinds of replica items are appearing in catalogs and online offering people something tangible they can have. The artifacts brought up from it wreck will be soon going up for auction. Premiere Exhibitions (which owns RMS Titanic, Inc) was awarded title and allowed to seek compensation from the court. Buyers must agree to abide by the covenants that will accompany the sale. The artifacts are to be carefully preserved and for public display. So only museums and companies that seek to exhibit artifacts will be bidding for the collection or rather groupings of artifacts. And all sales have to be approved by the court before they can be finalized. Many are rightly concerned about artifacts being sold. Salvage split the Titanic community into warring camps. On one side you had those, like Robert Ballard, who saw Titanic not unlike the U.S.S. Arizona and argued be a memorial. Titanic was a grave and ought to be treated with respect. The other side of that was that there was a lot to be learned from studying the wreck and bringing up artifacts. There was much we did learn from studying the wreck, such as that Titanic did split in two (due to the massive weight in the forward area) and that there was no long gash. Titanic was pierced to be sure but was by holes caused when the iceberg rubbed up against the hull. All the artifacts came from the debris field between the forward and crumpled aft section. The crumpled stern was likely caused by air trapped inside as it slowly sank to the bottom. Massive implosions took place as the pressure increased and the air had no place to go. The forward section was mostly filled with water when it went down so nearly all of its air was gone. Not so in the stern leaving it a twisted wreck. When the ship split in two, it allowed all the things tossed into the water–plates, silverware, luggage, shoes, dolls, to name a few–to spill out to the bottom floor where they remained undisturbed for decades. Probably bodies too but there were consumed by the sea a long time ago. The fiery debate over salvage proved how strongly people felt about Titanic. Unfortunately it created permanent wounds and even ended friendships. The issue, at least legally speaking, is resolved. 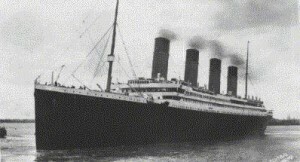 A U.S. Federal court had extensive hearings over whether RMS Titanic, Inc. (RMSTI) had legal rights was resolved in their favor. The court though kept jurisdiction owing to the historic nature of Titanic to make sure that artifacts brought up were properly conserved and displayed. And for the most part, that has worked out. There was a dispute over whether others could lower submersibles down to view Titanic. RMSTI argued it had exclusive rights to even view the wreck. The claim was rejected in U.S. courts and you are free to take the plunge down providing you have the cash (between $30-60K). With the centennial this year, many worry a repeat of what happened when Cameron’s Titanic came out. Titanic societies and online discussion forums were deluged with people seeking information often about fictional characters. The key difference is that this is not about the movie, but the real thing. Yes there will lots of merchandise offered on every conceivable detail about Titanic. Some of it very worthy (like new editions of old Titanic historical treatments or a digitally updated versionsof A Night To Remember). Others might be tacky like replicas of a necklace worn in that movie. Or perhaps Titanic cutlery or plates that were used aboard White Star Line ships. For years a certain soap has advertised itself in catalogs as have been used aboard Titanic. Is that tacky? Not quite since the soap is considered quite good. Of course an ice cube mold that shapes ice like Titanic is tacky or perhaps creepy. One wonders why you would want ice shaped like Titanic in your favorite adult beverage other than to get attention. For many ignoring the hype and focusing on the real story is key. We cannot forget that one of the most remarkable ships of her day sank on her maiden voyage after colliding with an iceberg killing 1,522 men, women, and children. All of their dreams and aspirations were silenced in that so very cold night when there were not enough lifeboats for all. While everyone likes to attack J. Bruce Ismay as the villain of the piece but they forget a complacent government that allowed for so few lifeboats to be required. One can argue endlessly about whether California saw or did not see the rockets Titanic fired but one thing is clear: had California raced to the scene just like Carpathia the outcome would have been the same. Of the bravery of many, stories abound. And those are what just some of what Titanic is about. Stay tuned for the stories to be told as the year unfolds.